This low cost PC mounted test point jumper provides a reliable and econmical solution for your board level trouble shooting applications. Lowest cost solution to board level trouble shooting. Exclusive self-postioning feature. Eliminate costly installation steps. This low cost, printed circuit mounted test point jumper provides a reliable and economical solution for board level, trouble shooting applications. Available in a variety of popular mounting dimensions and loop profiles, the TP-101 series offers the designer flexibility in the placement of crucial test points on high density circuits. 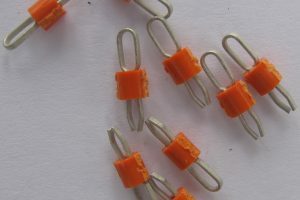 The exclusive, detented leg feature of the TP-101 series permits greater production and installation efficiencies by providing self-positioning and retention during soldering operations. 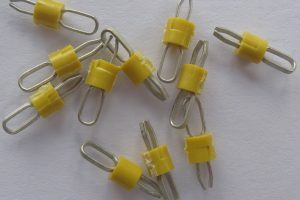 When mounted in the recommended .040″, “plated through” hole, the detented legs provide a snug, interference fit that will maintain the test point’s position while under the pressure of wave soldering operations. The “above board” profile of the TP-101 readily accepts a wide range of test probes and spring clips while offering a compact and space saving size. Formed from spring grade brass wire stock with matte tin over nickel plating, this product assures many years of reliable service at an economical cost. Specifications: Material: .020″ Dia. 70/30 brass wire. Finish: bright, electro-tin 100 millionths min. Mounting: two, .040″ Dia. +/=.003″, plated through holes. Max Current: 2 amperes. RoHS compliant. For larger quantities please call us for special pricing.